Metal Band Saws There are 12 products. Metal band saw, which is also suitable for transportation to the construction site. Weight only 22 kg. Continuous speed control. Very good quality saw with competitive price from one of the world's biggest machine manufacturer. Power: 550 W / 220 V speeds: 20, 30 and 50 m / min. Speeds: 3 options. Metal Band Saw, which can also be transported to the site. Blade: 1470 x 13 x 0.65 mm - the speed of 45 m / min. Motor: 370 W.
Ideal saw for small spaces. 550-watts powerful motor. Automatic stop for the blade. Easy blade change. Good and stable blade guides. Instant release for fastening the saw to be cut. Blade hydraulic fall. Swivel blade. Bevel angle 45 ° (right) -60 ° (left). Automatic stop. The tripod is included in the same price. This tool is one of the world's best-selling metal band saw models. Extremely high level of quality from the top manufacturers.Maximum cutting of circular metal 178 mm by 90 degrees, square178 x 305 mm, 45 degree angle of 127 mm round and 45 degrees square 110 x 180 mm. Motor 750 W.
New metal band saw in stock now. Versatile model and well equipped. Designed for professional use - with bargain pricing! New model, which has gained huge popularity all over the world. Highly competitive price. Prepared for demanding, professional use. Quick release of the piece. Cooling pump. Hydraulic lowering the blade. 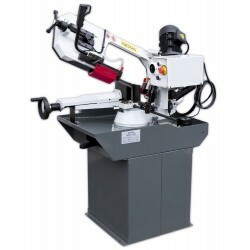 Nova 310 HDH is a half automated metal bandsaw made for demanding professional use.